Step by step how to cartoon with geometric shapes. Activities book to learn how to cartoon. Geometric shaped\s are used to build the cartoons. Designed like a comic book. Learn how to cartoon and build comic book pages. Cartooning activities for the different parts of speech. Cartooning activities show how a sentence has a head, body and a background. Who! What! Where! 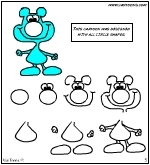 The cartooning worksheets have transitional phrases embedded in them to inspire the students creative writing.